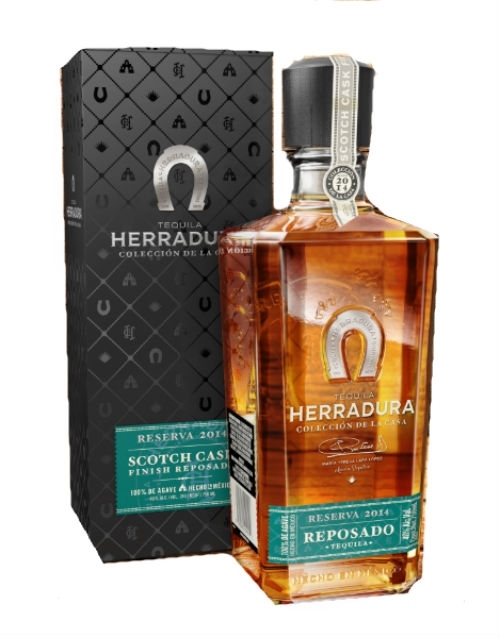 LOUISVILLE, Ky., Oct. 8, 2014 /PRNewswire/ — Stemming off the success of its small-batch tequila series, Tequila Herraduraannounces the release of the third Coleccion de la Casa, Reserva 2014 – Scotch Cask Finish Reposado. Having undergone a double maturation process after resting in two different types of oak casks, American oak and single malt Scotch casks, this limited edition tequila offers a desirable taste and finish to delight the senses. “With the latest in the Coleccion de la Casa small batch series, Tequila Herradura solidifies its commitment to provide new tequila experiences to discerning spirits drinkers who appreciate specialty crafted, artisanal tequilas,” said Liz Edwards, Senior Brand Manager for Tequila Herradura. Casa Herradura has a strong reputation as an industry innovator and is credited with introducing the first-ever reposado in 1974 and extra anejo tequila in 1995. Coleccion de la Casa is the best example in the industry of how each of the sources of flavor– agave, water, fermentation, distillation, and maturation – impacts the character of the final product and creates a totally new flavor profile. As with the other two editions, Master Distiller Maria Teresa Lara was the force behind the Scotch Cask Finish Reposado. Coleccion de la Casa, Reserva 2014 – Scotch Cask Finish Reposado will be available at fine wine and spirits stores in October nationwide for a limited time at a suggested retail price of $89.99. Color: Warm gold with brilliant hues. Aroma: A masterful combination of toasted malt, cooked agave, and smoky wood. Taste: The finest aged tequila is highlighted by the taste of vanilla, butter, honey, caramel and balanced soft spices. Finish: The unique scotch cask results in a long-drawn and with a touch of sweetness.